#1 – Continually improve your skills. How? 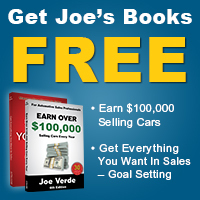 Make the decision to learn more about selling every day through JVTN®, in our workshops, with my books, these articles, or on our blog. #2 – Set clear goals. You need unit & income goals for the year, quarter and month – and to hit those goals, you also need clear goals for the sales activities that will create the unit volume, gross profit, and the average commission you need to hit your unit and income goals. #3 – Control your work day. Get organized with a daily action plan that will keep you focused on the most productive activities that generate more prospects, more demos, and more sales every day. A. 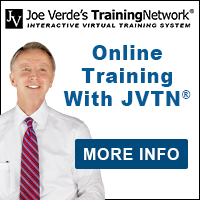 On JVTN®, take the Monthly Planning Guide course. It will be the most productive hour you’ll spend this year. B. Start using our (MPG) ‘Monthly Planning Guide’. Just fill in the blanks to set your goals, track your activities, and manage your day. #4 – Go To Work To Work! Stop going into the dealership because it’s time for your shift to start. Instead, go to work to sell cars, build your business, and to earn a great living for you and your family. #5 – Work with your best prospects. Repeat customers are your best prospects for future sales. Take “Sold Customer Retention” on JVTN®. The people who left without buying are your hottest prospects for a sale right now. Take the JVTN® course, “Turn Unsold Customers Into Be-Backs & Deliveries”. Your unlimited best prospects; service, friends, your sold customer base, and orphan owners in your dealership. Your attitude and enthusiasm will be fine if you’ll just do those 5 things every single day, without exception.